Benefits of cassava leaves seems familiar to us, this delicious vegetable is very much popular in various regions in Indonesia. This one vegetable is familiar with the tongue of Indonesian people, especially those living in rural areas. 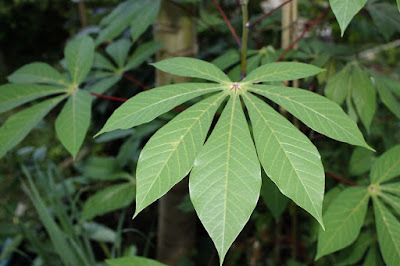 Cassava plants themselves are many and easy to obtain, that is why the cassava fruit itself or even the leaves, many used in the culinary treasures of the archipelago. The efficacy of cassava leavesDauun cassava is very familiar in the ear as one of the vegetable lucrative tongue, or by cooking with liquid milk, commonly called cassava leaves vegetables. In addition to the popular cassava leaves because it tastes delicious, the benefits of cassava leaves themselves are not less extraordinary. Here we will review the benefits of cassava leaves, closer. Nutritional content of cassava leaves is quite varied, as do other green vegetables, it also has a fairly high fiber content. Here are some high nutrient content in cassava leaves. Benefits of cassava leaves itself can we make reference through its nutritional content, but has been circulating in the wider community that cassava leaves is very suitable for various treatments and complaints of disease. Some valuable nutrients are contained in cassava leaves such as vitamin B1, vitamin A, essential amino acids and carboydrates. This certainly makes the benefits of cassava leaves very good when consumed as your daily menu. Cassava leaves are a very large source of vegetable protein, it is a type of vegetable protein that contains lots of vitamin B. Vitamin B is needed to build the body's cells that will form enzymes that help the body's metabolism. Humans continuously, in other words this cassava leaves help the process in the body. The content of various proteins or essential amino acids on cassava leaves is very helpful to provide useful energy for the human body. Essential amino acids on cassava leaves, help the changes of carbohydrates into energy that will be used by the body's activities. Cassava leaves is one source of excellent antioxidants to prevent and remove free radicals in the body. This free radical itself is one of the causes of various dangerous diseases such as cancer and in the field of beauty can cause premature aging. Essential amino acids contained in cassava leaves is one important source in maintaining and regenerating cells in the human body. Amino acids are proteins that can help in growing damaged cells and provide renewal of the cells in the body to keep functioning normally. Cassava Leaf It turns out also very well used for diet, fiber content and high protein in it is one of your daily healthy diet menu. Almost everyone knows that vegetable fiber is very good for digestion so it can help nourish the human colon, as well as cassava leaves. Regular consumption of cassava leaves will also give a good enough effect for our digestion. Cassava leaves are potent blood-boosting vegetables that boost your blood if you are exposed to anemia. Prescription treatment, take about seven sheets of cassava leaves and then wash. Rebusalah cassava leaves with water as much as 800cc. Leave until the water is 400cc. Drink twice a day, as much as 200 cc per drink. Cassava leaves are believed to be quite effective in terms of helping to reduce diarrhea. If you who like to happen aches after work, there could be symptoms of rheumatism in the body. Treatment solution, Prepare about 5 pieces of cassava leaves then mix the leaves of whiting and give a little water. Then squeeze until the concoction is destroyed and balurkan on the joints that feels shriveled. Use this three times a day. Benefits of cassava leaves is very big role for the human body, especially for those of you who are exposed to anemia. Besides delicious cassava leaves can also be made as a super delicious vegetables. 0 Response to "10 Benefits of Cassava Leaf For Health"